Objective: A novel sensorized laparoscopic instrument capable of sensing tip position in 6 degrees of freedom (DOF) and forces in 5 DOF was evaluated. 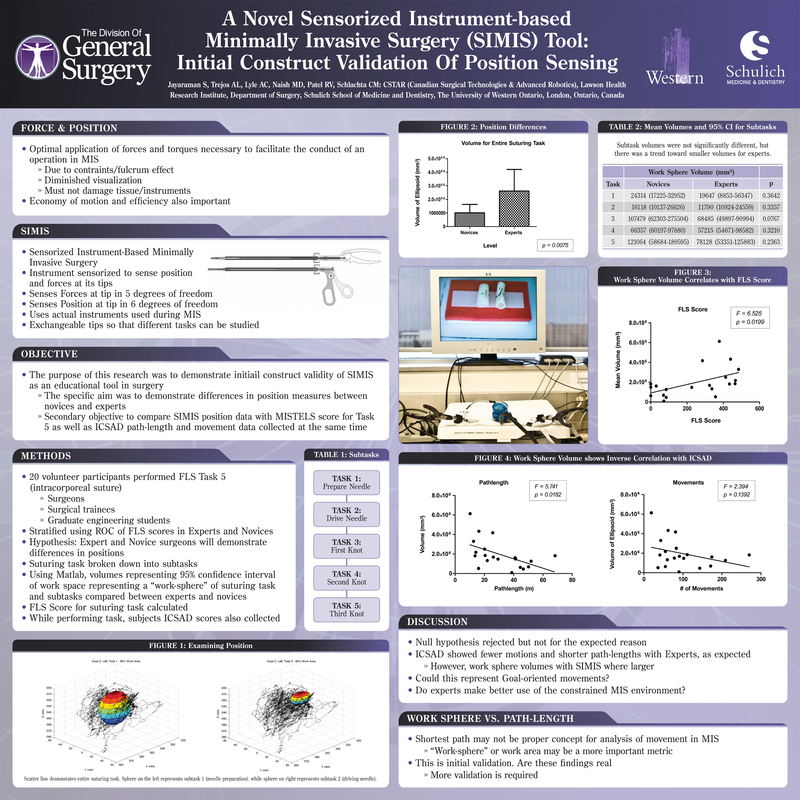 The purpose of this research was to demonstrate that the position sensing component is construct valid as evidenced by different position profiles between novice and expert laparoscopic surgeons. Methods: Using an FLS trainer, eight Novice and 12 Expert laparoscopists performed the FLS suturing task using the novel instruments. The suturing task was broken down into 3 subtasks: Task 1, needle preparation; Task 2, needle driving; and Task 3, knot tying (3 throws). Novel MIS instruments capable of sensing instrument tip position were used to compare position profilesquantified by work sphere volumes over the total task and subtasks. Work sphere volumes from the ellipsoids representing the 95% confidence intervals of the work spaces for the suturing task as well as the individual subtasks were extracted from Matlab (The Mathworks, Natick MA). Subjects’ path-lengths and numbers of movements for the suturing task and subtask were recorded using the Imperial College Surgical Assessment Device (ICSAD). Normality was assessed. Gaussian position data were compared using the Student’s t-test and non-Gaussian data were compared using the Mann-Whitney test. Data are presented as means ± SD or medians ± interquartile range. Work sphere data was compared to ICSAD path-lengths and positions using the linear regression. Correlation between work sphere data and ICSAD metrics was also assessed using the Pearson or Spearman correlation depending on normality. Results: Mean work spheres between groups were significantly different with Experts using a greater volume than novices (2.6 ± 106 mm3 ± 1.6 ± 106 vs. 1.0 ± 106 mm3 ± 6.2 ± 105, p = 0.0075). In contrast to the overall task volumes, non-significant trends showing smaller volumes for the individual subtasks were demonstrated for experts. Considering all tasks, a trend showing smaller mean task volumes for experts was found. Using ICSAD, Novices had a significantly larger mean path-length than experts (47.82 m ± 9.44 vs. 18.90 m ± 6.04, p < 0.0001). Similarly, novices used significantly more movements than experts (148.8 ± 72.45 vs. 65.33 ± 28.43, p = 0.001). Linear regression demonstrated that there was a significant inverse relationship between ICSAD path-length and work sphere volumes (F = 5.741, p = 0.0182). Correlation between ICSAD path-length and work sphere volumes (r = -0.5895, p = 0.0062) was also demonstrated. Linear regression for numbers of movements also demonstrated a trend towards an inverse relationship between ICSAD movement counts and work sphere volumes. Correlation was similarly non-significant. Conclusions: The novel instrument is construct-valid and capable of detecting differences in position profiles between novices and experts in the FLS suturing task. Experts use a larger work sphere for the overall task and smaller work spheres for subtasks. There is an inverse relationship between work sphere volume and path length and numbers of movements suggesting that experts may make more efficient use of space.